So what happens to your worn out pair of shoes? Do you want to throw them away to be stocked in a toxic rubbish pile or would you rather plant them in the ground and watch it grow into a beautiful tree? 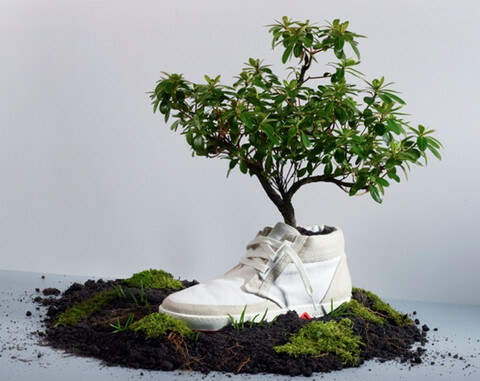 The answer of course lies within the latter statement – who would not want to see a pair of shoes blossom into a living oxygen giving plant? It is said that your feet are the one thing that can keep you close to the ground and earth; it makes you apart and one with Mother Nature. Piccadilly is constantly thinking of ways to keep the wearer tied closely to their roots, keeping it natural and stylish, making these two terms synonymous by creating sustainable and eco-friendly shoes. This provides as a mechanism that helps the wearer make green change for the planet while staying fashion forward. How does Piccadilly accomplish this task? The answer lies in biodegradable shoes made from materials capable of being broken down rapidly by the action of microorganisms. Essentially, Piccadilly has replaced the cardboard used in its footwear sole construction with sustainable materials. In one year they saved 3,264 trees from being cut down. Their soles are not the only sustainable part, with the lining of the shoes are used as filler for mattresses, pillows and cushions. Using water based adhesive glues without solvents makes gluing soles a lot easier with optimum efficiency and ensures less risk to their valued employees. Recyclable waste from their plant such as paper, plastic, metal, glass and liquids are directed to legally associated companies for reuse. Nothing throughout the entire process goes to waste. Piccadilly enjoy doing their part for the planet, while keeping it stylish, computer parts are donated to school s which are effectively used for the learning of students. Responses to these actions have been so positive that they have become a routine of the planet. Piccadilly stress the commitment of the production method in regards to the health of the environment. Not only technology advanced, Piccadilly develop their state of the art materials as biodegradable, proof that great designs can also come with sustainable means. They fit and mould the best concepts to their shoes that can enhance different aspects under many arenas. In terms of product use, more often than not shoes are thrown away after use, where it goes, how it gets there and the impacts to the environment are not usually considered which can move away from creating a more sustainable world. Piccadilly shoes are not made of leather tanned with chromium nor does it contain Lead and Cadmium in its composition. Toxic elements when in contact with the ground can contaminate groundwater and if swallowed can lead to detrimental effect such as degenerative diseases affecting the blood, nervous system, kidney and gastrointestinal tract. Biodegradable shoes can provide more than just function and practicality. Designed from organic and eco-friendly materials, the wearer can rest assured their shoes are made from the safest materials that will help the planet. Integrating eco-friendly practices into your daily lifestyle is a great way to start giving back to the planet, perhaps it is time to start switching up your wardrobe for some sustainable yet fashionable alternatives, and biodegradable shoes are definitely a great option. Think future generations, think sustainability but also think style. Piccadilly have been ahead of the technology front for a long time, their enthusiasm to provide the best for their customers surpasses technology and simply evolves from their sheer passion to provide sustainable, fashion forward designs made simple to enhance a lifestyle but also help this world we live in. See Piccadilly Shoes on stand 3222 at Fashion Exposed Sydney from 16 – 18 August, 2014 at Sydney Showground, Olympic Park. Tags: Biodegradable, Earth, Environement, fashion, fashion exposed, fashionable, footwear, Piccadilly, shoe, shoes, style, stylish, sustainable. Bookmark the permalink. hmmm…biodegradable shoes..sounds awesome to me! Great article Sacha and hopefully we will open an exclusive store in Australia soon. For now, everyone is welcome to our New Zealand Store in Auckland on Teed St, Newmarket. I think, this is one of the great innovation of today’s time. We all know the current situation of our world, too much waste and most of these are non-biodegradable materials. Hopefully this will change the current situation. At least prevent the worsening of the damage.